Please note that as a publisher we are happy to quote on specific/individualized items upon request. Please be patient while page and photos load. Let us print, prepare and mail for you! Take the worry out of your specialty mailing! Supply us with the information for your special mailing and let us do the work! We can work from handwritten copy or computer files. We can do as little as work with you to create a custom pre-printed paper that you can commission to use this year and years to come from the comfort of your own home. Send your words and addresses and we will type it, print it, address it and mail it for you. Working with computer files (or handwritten copy), we can produce your one of a kind mailer which you will get ready and mail yourself. We can produce a self mailing piece that has your addressee printed right on it. We work from MS Office database or spreadsheet files to accomplish this. As our offices are within driving distance, we can even have your Christmas mailing postmarked from Noel, MO! If you have a long mailing list (200+), provide us enough time for production and slow mailing and we can even save you postage by sending them out business standard (bulk) rate (postmark - Wyandotte, OK). We can add a CD to your mailing as well - you provide the original (non-Copyrighted or Copyright released), we'll do the reproduction. If we are mailing your item, postage discounts are also possible, in quantity. Mailed items may be self mailers, enveloped, or contain a variety of enclosures. 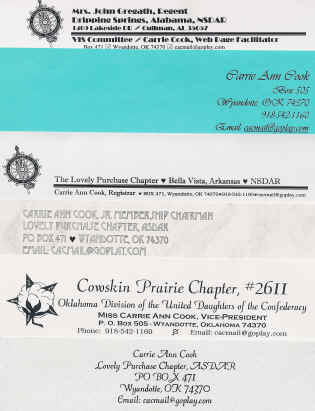 Your mailings can be printed in one color of ink on white, or a variety of solid colored paper. Spot color and full color printing is also available. 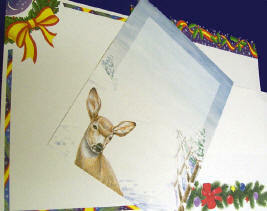 Your printing can be done on "pre-printed" color stationary paper as well. All quotations, unless requested, are for matte finish, flat printing, though raised printing (thermograph) and a variety of weights, as well as gloss and coatings are available. Contact us now for all your stationery needs for Christmas and beyond: from envelopes, note paper and folded cards to business cards, post cards and embossed announcements. Layout costs (optional) $10-30 depending on requirements. Also, contact us with your needs and we will email you a personalized quote! Short (1-99) runs available only in black imprint.